SEOUL, Oct. 31 -- China and the Republic of Korea (ROK) on Saturday pledged to deepen their pragmatic cooperation in various areas ranging from innovation to manufacturing, cementing the strategic cooperative partnership between the East Asian neighbors. 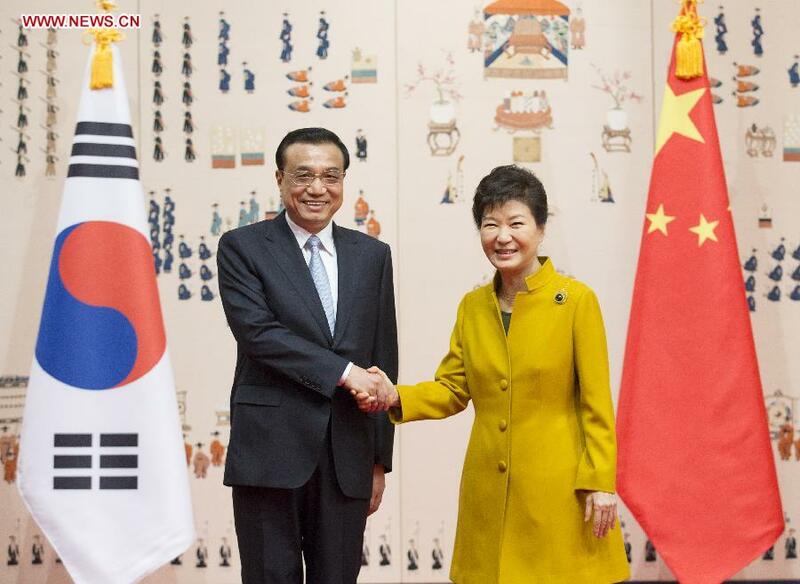 The agreement came as Chinese Premier Li Keqiangmet with the ROK President Park Geun-hye after starting his three-day ROK visit, which will also see him attending the trilateral summit between China, Japanand the ROK. Li told Park that the development of the China-ROK relations has maintained desirable momentum, bringing benefits to the two peoples and the regional stability and prosperity. A total of 17 bilateral business contracts and governmental accords in areas including trade and economy, science and technology, environmental protection and people-to-people exchanges, were signed at the witness of Li and Park after their talks. In his five-pronged proposal for closer ties, Li called on the two nations to build up synergies between their own development strategies so as to create new highlights in their already-close cooperation. Li said that efforts should be paid to synergize and integrate China's Belt and Road initiative and the ROK's Eurasia Initiative, China's mass entrepreneurship and innovation and the ROK's strategy for a "creative economy," the "Made in China 2025" initiative and the ROK's "3.0 strategy for manufacturing innovation", as well as the two nations' efforts to explore third-party markets in the production capacity cooperation. "We should seize the opportunities of such synergy and strengthen our cooperation in innovation, intelligent manufacturing and development and research of high-end technology," Li said. "They will boost the transformation and upgrading of our economies, promote regional inter-connectivity and bring us mutual benefits and common development," he added. He also called on China and the ROK to deepen their strategic cooperative partnership and enhance high-level exchanges and dialogues on different levels. Since last year, Beijing and Seoul have worked on upgrading their ties toward a partnership for joint development, regional peace, Asian revitalization and world prosperity. China now stands as the ROK's largest trading partner and largest source of import while ROK is China's third most important trading partner. Their trade volume is expected to reach 300 billion U.S. dollars this year, a 60-fold increase over the past 20-plus years. In the meeting, Li urged the two nations to launch maritime demarcation talks as soon as possible and strengthen cooperation in areas including coping with non-traditional security threats, law enforcement and disaster relief. The premier also called on China and the ROK to build platforms for the cooperation in innovation and entrepreneurship for the youths and in jointly exploring the third-party markets. Commenting on the East Asia integrity, Li urged efforts to facilitate negotiations of the China-Japan-ROK trilateral free trade zone (FTZ) and the Regional Comprehensive Economic Partnership (RCEP) to better connect the region. The three big economies in East Asia started the FTA negotiations in November 2012, discussing commodity trade, services and investment. The next round of such negotiations which is scheduled at the end of this year might include talks on commodity tariff reduction and services market access. Li urged China and the ROK to deepen their people-to-people exchanges to consolidate public support for bilateral ties. China and the ROK are each other's largest source country of overseas students and overseas travel destinations. Last year, the bilateral personnel exchanges between them surpassed 10 million. Talking about the scenario on the Korean Peninsula, Li said that China is devoted to maintaining peace and stability and realizing the denuclearization on the peninsula. He said that problems should be solved through negations. He added that China firmly supports the efforts of the ROK and the Democratic People's Republic of Korea (DPRK) to improve bilateral relations and promote reconciliation. On her part, Park said that the close communication between leaders of the two countries is conducive to the development of bilateral ties as well as the peace and stability on the Korean Peninsula and the Northeast Asia as a whole. She agreed to Li's proposal to synergize the two countries' development strategies and said the ROK stands ready to strengthen cooperation with China in areas including trade, economy, finance, innovation, manufacturing and medical care, adding that her country is also willing to conduct production capacity cooperation with China in third-party countries. She said she hopes the ratifying process of the China-ROK FTA can be fast-tracked and become effective at an early date. Park added that the ROK side attaches great attention to China's important role in pushing forward the denuclearization on the Korean Peninsula and maintaining the regional peace and stability. She pledged that the ROK will continue to strengthen communication and coordination with China on the issue.